Sandwiches can get extremely boring eating them day after day, so it’s good to have some other lunch ideas in mind. If your kid is sick of eating sandwiches every day, or just doesn’t like them in general, below are 7 healthy and delicious alternatives they are sure to enjoy. Not only are the options below sandwich free lunches, but they are also super healthy! Sandwiches are often mom’s go-to for lunch because they are easy and quick to make, but there are so many other options out there. Not only are there other things easy to make, but with a little creativity, they can be so much more appetizing than a regular sandwich. Taking the time to pack your child’s lunch every day has endless benefits. It ensures they’re eating a healthy meal, can help to save money, allows them to easily avoid certain foods or ingredients, and it can help prevent them from contaminants that may be found in plastics the school’s use. If you have a picky eater on your hands, packing lunch can relieve a lot of stress for them so they don’t have to worry about what the lunch line has to offer. Packing your kids sandwich free lunches helps instill in them healthy eating habits that can last a lifetime! 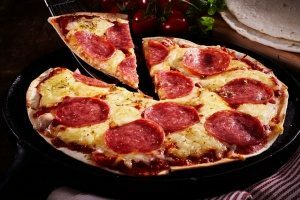 A tortilla pizza is a fantastic twist on a classic that will prevent your kids from entirely getting sick of sandwiches. Spread some tomato sauce on a whole wheat tortilla, add mozzarella and any other toppings of your choice to customize it to your kid’s liking. You can either bake it in the oven or heat it up in the microwave so the cheese can melt, whatever’s easiest for you. A tortilla pizza helps you avoid making a sandwich and also has the added benefit of tasting like an authentic delicious pizza. Who wouldn’t want that for lunch? Pasta of any kind is always a good go-to. Whether it’s from dinner last night, or it’s made specifically for lunch, you simply can’t go wrong with it. A great healthy idea for a pasta dish is a tortellini salad. Use whole wheat tortellini, and in some peas, and mix it all up with pesto to give it amazing flavor. This dish can be eaten hot or cold, so you can serve it in a practical way that works for you. You can also make big batches so you have leftovers to use for the next few days. Tortellini salad can work great as a main entree or as a side. 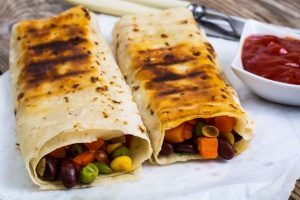 Burritos are another one of the greatest sandwich free lunches, and because they are typically bigger, they can hold a lot more ingredients to pack a nutritional punch. Start off with a base of a whole wheat tortilla and black beans, and from there add anything you like! Some options are steak, chicken, corn, green peppers, lettuce, and tomato. The best part about this option is that there are so many possibilities that you can have a totally different burrito every day! Changing out a few ingredients can make a huge impact on taste so you won’t get sick of them. This is a great way to have the convenience of a sandwich without actually having a sandwich! Elect for a whole wheat bagel of any kind you like (cinnamon raisin is a great option), and add goat cheese and grape jelly for a deliciously healthy filling. You can make this bagel in almost no time in the morning and it will ensure that your child stays full until dinner! It’s also easy to store so you don’t have to worry about it falling apart on your kid’s way to school. If they don’t like goat cheese you could substitute for low-fat cream cheese, peanut butter, or almond butter. Food that comes in ball form is always more fun to eat. Cook some short-grain rice and add in ingredients like chopped cooked vegetables, and then roll them into one inch balls. These are easy to make in a large quantity and save well in the fridge so you can use them for more than just lunch. In some ways, wraps are the new sandwiches! Spread dijon mustard on a whole-grain tortilla, then add thinly sliced turkey and lettuce, finally wrap it for a delectable lunch! Just like all of the other options provided, this can be customized or changed up every day for some variety. You may even find that your kid prefers these trending sandwich free lunches over classic sandwiches! An easy meal to prep the night before is brown Spanish rice. You can even add meats like chicken or ground beef to add some protein. Simply reheat it in the morning and put it in a heat-containing bento lunch box. The easiest way to pack sandwich free lunches is to put them in a bento lunch box. These come with dividers that allow you to store all your food in one container without it becoming a jumbled mess.They’re great for making organization super easy when you’re swamped in the morning. A good bento lunch box will also ensure that the food stays at the temperature you want it to be at and that it is super fresh when it’s finally time for lunch! Unbeknownst to most people, BPA is a toxic chemical that is used to make different types of plastics. Often times BPA is in containers that are used to store food. When food is placed in these containers it’s at risk for absorbing some of the toxins. When the food is then consumed, the toxin enters the body and has the potential for some adverse health effects. BPA can affect the brain, behavior, and prostate glands in fetuses, infants, and young children. This is why it’s extremely important to be diligent about what kind of container you are using to pack your kid’s lunch. Choose a BPA free bento lunch box that will help eliminate your worry about this toxin.